Attendance: 36,470. So often the Playhouse of Comedy, Gallowgate is now transformed under Bobby into the bedrock of our upward mobility. For an away support supposedly composed entirely of shareholders and corporates, there weren't half some scruffy buggers knocking around, five of whom were dragged out after big Dunc's goal. Aside from the ongoing rumours of OT ticket office skullduggery, surely privileged people haven't been selling tickets on to touts have they ? Why, that would be unthinkable for a club of their stature......some illuminating stories would have been unearthed had someone taken the time to question those present, it's not just at Wembley that the corporate circus goes on. 26 mins: As good a goal as you are ever likely to see: a left footed Duncan Ferguson volley from just outside the box, that went past Bosnich like the bullet from a gun. 86 mins: Houses were brought down as Helder disrupted a Reds attack midway in his own half, brought the ball free in the style of Albert, knocked it to Domi and watched as his fresh legs propelled him down the left side, a la Ewood Park. "It was a big spectacle for the supporters and a magnificent match. "We have beaten a very good team here today...the dismissal of (Roy) Keane was vital." "We were careless. The Ferguson goal was a marvellous hit...when the second goal went in, that was it - game over. "But you have to take risks if you want to recover and we will take them." Well, once again the Nation loves us, and everyone from Alan Shearer to uncle Bobby, David O'Leary and publicans everywhere allowed smiles to play across their lips on Saturday teatime as the lads rolled back the years. Returning to reality for a few moments, despite all the media clamour and adulation afforded our wrinkled supremo, the fact remains that the team he presides over are thirteenth in the table at present. Without turning into a whinging mackem about it though, three points gained at the expense of Alex Ferguson, mirth-inducing they may be, are the same three points that should have been taken from Paul Jewell or Egil Olsen. In fact it could be argued that a victory at either Valley Parade or Selhurst would have been of greater objective value, depriving our fellow strugglers of precious points. While a crushing defeat of the Old Trafford synchronised moaning XI is to be savoured and replayed, again and again, this season we won't have any interest whatsoever in the Championship race again until Mid-April when Leeds come visiting. I think the phrase I'm frantically searching for is pyrrhic victory. Only when we can reach the level of consistency demonstrated by Messrs Cole and Beckham etc. can we really abuse the hangers-on and social deviants from a position of strength. We've won two away this season, they've won six. On a brighter note though, it's encouraging and timely that our once-feared home reputation has been rebuilt week by week, as the ground is rebuilt around us. The prospect of seeing goals at Gallowgate tends to tempt the uncommitted, and those extra seats will need to be filled to keep the debtors at a safe difference. There are few better sights in football than seeing a good old-fashioned Alex Ferguson bleat, and Saturday provided a golden moment for connoisseurs of the paranoid. It's all a vendetta apparently. Yes Alex, and people are watching you from down the plughole of your sink. From my jaundiced position, it seemed to me quite simple: referee Lodge and the Newcastle team seemed slightly in awe of them for the first twenty minutes of this match, and things didn't look particularly promising for the home fans. It took a while longer for referee Lodge to sicken of the Red antics, but sicken he did; a combination of seeing his officials abused, being harangued after the end of the first half and having a three-line whip berate his every whistle, led to the inevitable and correct decision when the idiotic Keane lunged into Lee in a neutral midfield area. While he at least walked without murmur, his colleagues indulged in the same gobshite panto witnessed at Old Trafford against 'Boro. Result? The referee now became completely unsympathetic to whatever future claims Man U had, justified or unjustified (including a goal). Which of course leads to highly-paid professionals acting like street urchins, and their old-enough-to-know-better manager squawking away like a demented parrot. Splendid. As early birthday presents for uncle Bobby and Kevin Keegan, this one was hard to beat. 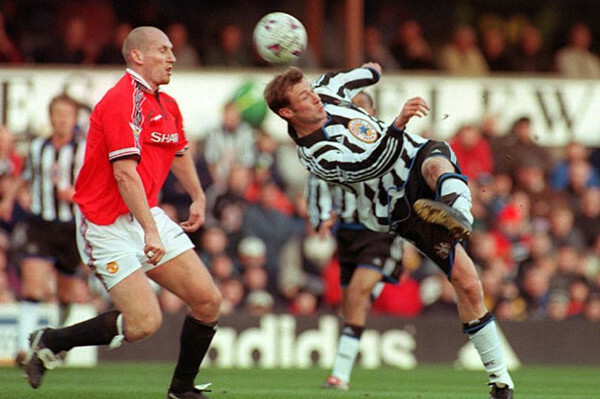 Both managers must have taken strength from the goalscoring resurgence of Shearer. For Bobby, the absence of Solano has been partially compensated by the assists Domi has brought to the party, while Hughes ably covered for the absent Alessandro Pistone. The fettled Italian even appeared on the pitch for a pre-match wave before heading back for some Italian-based recuperation, and presumably had a few words of encouragement for his team mates. One can't imagine that happening under the previous regime. Hopefully the spirit engendered in the Newcastle camp at present between players, fans and management may spill over into the administrative areas...but I doubt it. PS: Got all the way through and never mentioned the 5-0. Are you impressed?